“I think the take-home message is: MERS is not SARS” (Zaid Memish, Deputy Health Minister, Kingdom of Saudi Arabia, 30th August 2013). 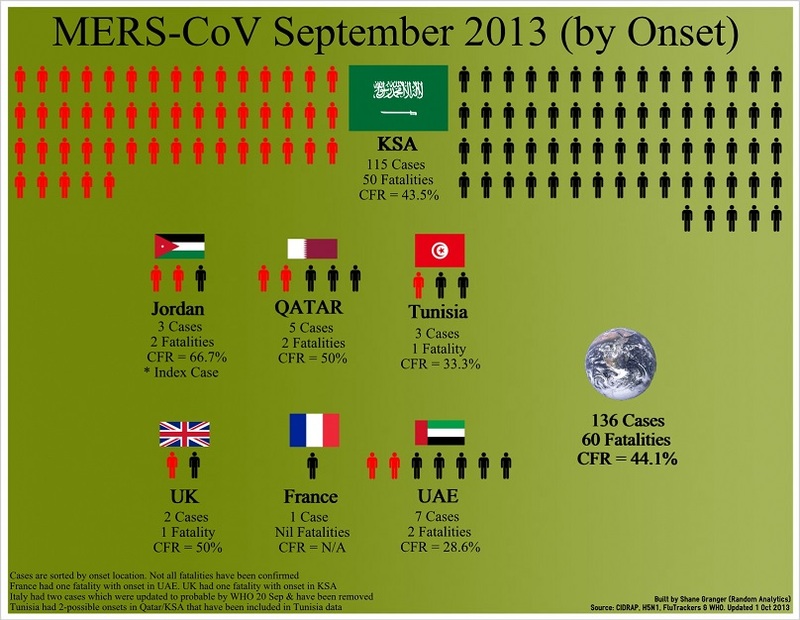 The above infographic shows the distribution of MERS-CoV by onset country. The Kingdom of Saudi Arabia (KSA) has had the most cases and the numbers are reflective of the latest KSA Ministry of Health figures. The most recent fatality outside of the KSA that I have included in my data was from Tunisia. Some countries, such as France and the UK have had fatalities that are not shown above due to the fact that the onset occurred elsewhere in the Middle East. The Tunisia index case seems to have occurred in Qatar or the KSA but at this time is still included under that countries flag. Italy initially reported two cases but these were later amended to probably by WHO due to testing issues. A number of fatalities are not shown as their details have not been made public. Ian M. Mackay, via his VDU blog has been discussing the spike in case numbers during the month of September. To emphasise his point here is the index chart that I published on the 4th September 2013 (110-cases & 50-deaths). Data can be many things to many people. For health investigators it is a critical resource to build a story about new or emerging diseases, for medical professionals it is a tool to inform while for the public it is a way to tell a complex epidemiological story in a more manageable format. It has its drawbacks though. Data alone often tells a non-contextual story only. Reading the back story on MERS-CoV I couldn’t help but reflect on the story of Abid Hussain (case number 10). Abid had travelled to his former home of Pakistan then visited Mecca to pray for his 39-year old son who had been diagnosed with cancer and was in the process of receiving chemotherapy. Upon his return to the UK he became unwell with severe flu like symptoms and either prior to being hospitalised or during his hospitalisation managed to pass on the disease to both of his adult children. The daughter only showed mild symptoms, did not require hospital admission and made a full recovery. The son, Khalid, a father of two and in the battle of his life could not stop a second assault on his system by MERS-CoV and succumbed to the disease just eight days after being admitted to hospital. Acknowledgements: Data for this infographic was sourced largely from CIDRAP, H5N1, FluTrackers and the WHO. Background reading supplied mainly via Pandemic Information News, Ian at Virology Down Under and Helen Branswell. Case numbers and fatalities have been updated regularly by multiple agencies. Here are the CIDRAP daily overviews which included case updates for the 3rd – 4th – 6th – 9th – 11th – 17th – 18th – 20th and the 30th of September 2013.